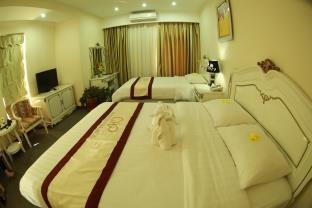 Stop at White Palace Hotel to discover the wonders of Ha Tinh. The property features a wide range of facilities to make your stay a pleasant experience. Service-minded staff will welcome and guide you at the White Palace Hotel. Guestrooms are fitted with all the amenities you need for a good night's sleep. In some of the rooms, guests can find television LCD/plasma screen, internet access – wireless, internet access – wireless (complimentary), whirlpool bathtub, air conditioning. Access to the hotel's sauna, massage, garden, steamroom will further enhance your satisfying stay. Discover all Ha Tinh has to offer by making White Palace Hotel your base.